1 Haken: More girlfriend troubles, mein Führer? 2 Hitler's Brain: Ja. Now she wants to get married! Not a simple service, either. A big fancy wedding with all die trimmings! 3 Hitler's Brain: Der big guest list, Köln Cathedral, full reception, ice sculptures, string quartet, even die waltzing! 4 Erwin: She puts die "formal" in "formaldehyde", ja? 4 Haken: Das ist nicht funny, Erwin! 4 Hitler's Brain: Ho ho! 2012-11-15 Rerun commentary: In 2003 when I wrote this comic, I'd never seen the Köln Cathedral. 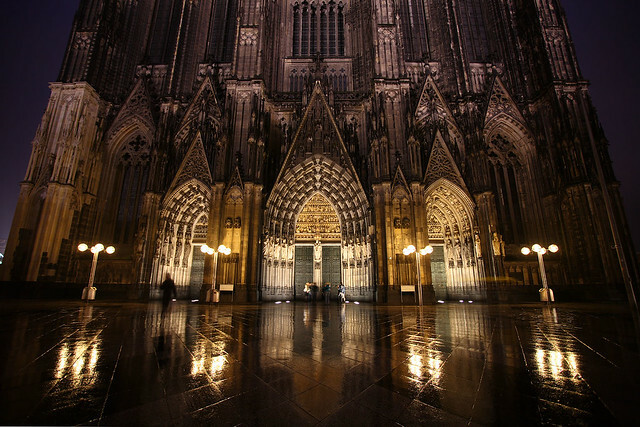 But in 2007 I visited Germany and added a side trip to Cologne at the end specially to see the cathedral. Last Modified: Thursday, 15 November 2012; 02:11:02 PST.